I'd been worried about it, that maybe I wasn't as much contented with the idea as my rational mind told me I should be. On the one hand, we have just enough space (well, ok, a little less than enough) for five people in our home and our car. We have literally no extra room for one more. We have trips planned out for the next decade of places we want to visit with our children, plans that would be greatly curtailed if we had another baby, and perhaps delayed to the point that our oldest, Mikko, doesn't get to enjoy many journeys with us. This last pregnancy (particularly the final trimester, when it was all I could do not to physically fall apart) and birth (weeks of prodromal labor and a posterior presentation, oy) were really hard on me. Recovering from the pregnancy has been really hard on me. I'm just now to the point that I'm not accidentally falling asleep all day from fatigue. I'm trying hard right now to knit myself back together and take charge of healing. Having another newborn? Not in my best interests, health-wise. And we're homeschooling our kids, so it's hard enough right now to split attention between three wildly different ages. How would it be with four? That's all the rational stuff. The reasons Sam and I have both agreed upon that we're done, that he's going to get an appointment for the Big Snip, that we're happy with what we've got. Then I look at the photos on my screensaver of Karsten magically morphing from spindly newborn to fluffy five-month-old. I chuckle that I can't fit my hand around his calf, his arm, his foot. He's getting literally so big. And I look up at Mikko with his mouth half-full of unwieldy permanent teeth and Alrik with his preschooler face and limbs carved free of his baby pudge and know, my gosh, it all just goes by in a blur, doesn't it? The changing never ends. I feel in Karsten's mouth, and there's his first tooth, a tiny white razor poking through his bottom gum, and meanwhile he's pushing me off so he can kick and flap and once again perform his favorite current trick of rolling over onto his stomach and then bawling that some mean person put him on his stomach. I passed by an upscale maternity boutique, and even though I know I could never afford one item of clothing from it, I looked longingly at the mannequins with their adorable bumps and know I'll never be that cute again. I loved being pregnant. I loved my maternity clothes. I know a lot of people don't, but I did. I'm contemplating getting them ready to sell in a lot on eBay, and it will be like saying goodbye to good friends. Every day, seriously every day, Karsten outgrows another piece of baby clothing or a diaper cover lovingly handed down from a brother, and I'm collecting them all to pass on — but not to my own child, to someone else's this time. To think I'll someday never breastfeed again, when it's been so much of my life these past seven and a half years and I've been so good at it. (This not said to brag, obviously, but to say honestly that it's been simple and enjoyable for me and my nurslings.) That someday my baby carriers will be unused, even though I've freaking written a book about babywearing. That I'll be at a loss at some point about what to blog about here. That I'll never have another baby inside me, another birth experience, another squishy newborn and then adorable toddler and charming preschooler and so on. That a door is closing, and I'm the one closing it. Which is why: I am thankful for that dream. I am thankful for the reminder that this is in fact my choice. That I know what my body, my health, my family, my finances, my mental capacity can gracefully handle, and I've chosen to go up to the limit and no further. I can't even say we'll someday foster or adopt, though I'd like to, because in our current quarters we have no space to, and I don't expect a financial future where we'll be gifted a larger house. But who knows? It still makes me emotional. It still makes me want to skim over the pregnancy announcements on Facebook for awhile. But here, now, with my littlest one napping beside me, I am content with what I have. More than content: I am happy. These are my three children, and this is my family, and this is what I'd dreamed of having. and truck them to Goodwill? the monkey hat you outgrew. You never stay at all. tuck them away or pass them on? If you feel like sharing, what is your story of family size? Did you get to choose at all, or has smaller or larger been chosen for you? Have you had an inner picture of your family at a certain size, seated around a table, and did you or do you think you will match your vision? Have you and your partner(s) agreed on how many children to have? Perfectly written! 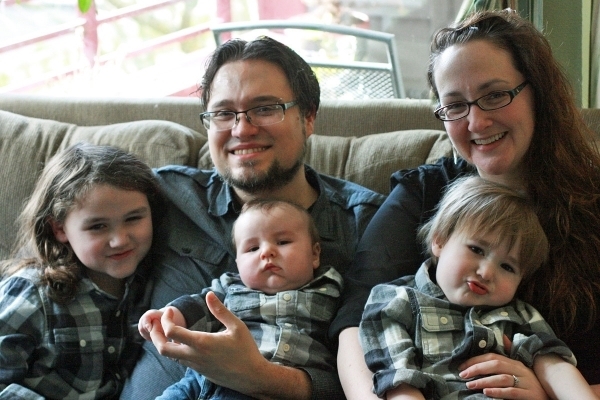 After I had my second baby, I was blissfully content in my complete family. I was relieved that that chapter in my life was over. I gave away some of my maternity clothes to friends. When my second was about one, those feelings started to change. I started to want another baby. I couldn't pack up the baby clothes (she's two and they're still bagged up in the laundry room!) My oldest loves babies and would love another baby sibling. I'm a rational person. I have a list of reasons why I should stick with my two lovely children. My biological wants sometimes creep up, but it seems, as for now, my logical reasoning wins. After all, no matter how many children a woman has, there has to be the last one-- the baby of the family. I live in a young neighborhood, lots of kids and babies. I do feel some outside pressure to have more children (here in Utah two children is a very small family!) My husband has also gone back and forth wanting another baby, but he ultimately winds up in the two-kids camp, like me. When I had just my two oldest girls, and had just had my second miscarriage, I came to accept that I would just have the two girls. I truly felt at peace. But since then we've had three more babies and I'm pregnant with another (this one will be our sixth baby, not counting our losses). I was so ecstatic to have these miracles after having losses. But after my fifth little one was born I struggled with if we were done or not. My husband was all signed up to go in for a vasectomy and I freaked. I made him cancel. He was really upset with me but respected me (I wrote a blog post about my indecision months ago). Right when I came to terms and truly felt at peace and was READY for him to get 'the snip' I took a random pregnancy test and boom! Pregnant!!! So of course the one month I don't chart, as we do NFP, I got pregnant with this newest little one. So yes I am done. I was done before I got pregnant this time so I really feel like I can enjoy all the lastness of this baby since I know this baby is the last (I wasn't sure my fifth little guy was the last). I am so thrilled now that the shock has worn off. We also homeschool and I'm due the end of summer so I'm going to be doing school planning the last weeks of pregnancy so we have it all ready-to-go once I'm ready to get back into the groove of school with a newborn.